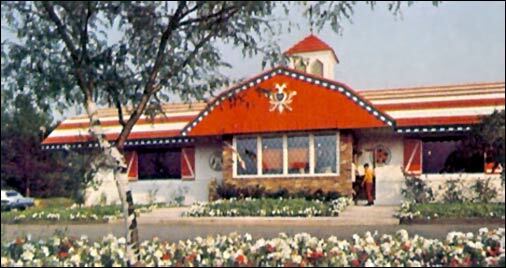 The Dutch Pantry Family Restaurant chain developed from modest beginnings shortly after WW II, and then grew utilizing visually unique buildings meant to resemble Pennsylvania Dutch barns. Other keys to success were the chain's standard and reliable portion controlled fare, appeal to children, and sales of Pennsylvania Dutch themed gift items. List of locations is incomplete. His presence here, a happy lot. This “Golden Finch” was once the rage. By folks in Prussia and Germany. As all good Dutchmen, he grew and grew. With one head in front, and one in back. Poem on the children's menu offered free dessert when the kiddies recited it from memory! Submitted by Denny Kelly. Above: Pennsylvania Dutch motifs were used extensively in Dutch Pantry's advertisements. However even as the region's inhabitants were "German," a Dutch windmill likeness came to be the chain's logo! An outgrowth of Lottie Kemberling's farm fresh foods, she and her son Jess M. Kembering opened their first Dutch Pantry Restaurant in 1945 along U.S 11 near Selinsgrove, Pennsylvania. Mrs. Kemberling said that the name of her restaurant was derived from the Pennsylvania Dutch region with its German descendants and their unique culture. 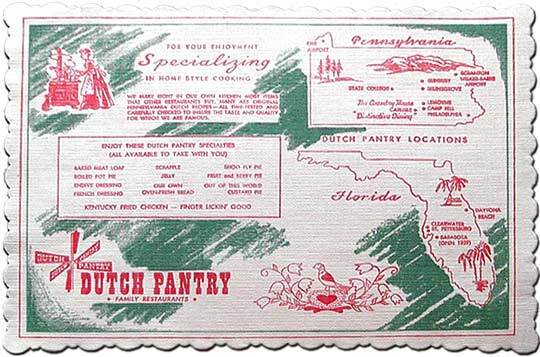 More directly, the name Dutch Pantry referred to the notion that every Pennsylvania Dutch home contained a large pantry stocked with good food! The chain gradually expanded during the 1950s and 1960s with additional units in Pennsylvania and then in Florida. The enterprising family soon caught the franchising bug which allowed steady growth by the end of the 1960s. A standard restaurant design was settled upon with an image that reflected the food and atmosphere of the Pennsylvania Dutch country. The buildings, said to simulate colorful Pennsylvania Dutch barns, were facadism at its best. Exteriors were decorated with hex signs, roofed with eye-catching red and white porcelain enamel tiles, and topped with exaggerated cupolas. The restaurants were fanciful caricatures of Pennsylvania Dutch barns! The standard restaurant interior featured a luncheon counter, and two dining rooms flanking a country store merchandising area that sold candy and gift items. The interior was rustic with rough hewn beamed ceilings, handcrafted furniture, and a large cast iron stove--all said to create an old fashioned kitchen atmosphere (reminiscent of modern day Cracker Barrel Restaurants). The experience was geared to family dining and featured a wide menu selection, and offered an award winning unique children's menu. As the chain evolved, food items became standardized and portioned controlled. To ensure quality most food was prepared at a central commissary--first called Lottie's Kitchen and then renamed Kemberling's Foods. In addition to the central kitchen a training facility called Dutch Pantry University was created to provide management training in all phases of Dutch Pantry operations. 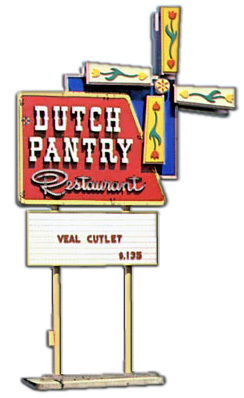 A corporate ownership change in the early 1970s resulted with Dutch Pantry in the hands of C.P.C. International which made Knorr soups and Mazola oil. C.P.C. had grand plans for the chain and projected 300 Dutch Pantrys for the U.S. and Canada by 1972. Although the chain did grow and attracted large franchise holders like Standard Oil of Ohio (SOHIO) and later allowed for existing buildings to be converted into Dutch Pantry Restaurants by other franchisees, the goal of 300 units was never attained. In 1983 there were 52 restaurants in 12 states, but by then the chain was in steady decline. Many of the locations were owned by the Helmsleys and when SOHIO's successor Rains International failed to pay the rent, eviction proceedings began. During the late 1980s, the chain utterly collapsed and restaurants were closed, converted, and demolished. By the 2000s only a couple remained operating, and they tenuously hung on to the Dutch Pantry goal--to transport a picturesque patch of Pennsylvania Dutch countryside no matter where thay are. Above & Below: With its origins in Pennsylvania following WW II, outlets began popping up in Florida during the 1950s. A not uncommon practice, several chains operated units in the Sunshine State as distant outliers. 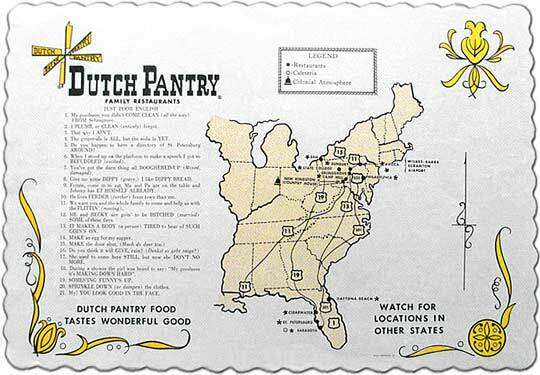 Dutch Pantry was a Kentucky Fried Chicken franchisee. That is to say, prior to the creation of KFC restaurants, individual restaurateurs and chains served Colonel Sanders' secret recipe chicken in addition to whatever other specialties they may have offered. Note that the Sarasota Dutch Pantry opened in 1959 and was cafeteria style. Moreover Dutch Pantry also operated a restaurant called New Kingdom which featured a colonial atmosphere. Red & White Glasiron Roofs Identify the Dutch Pantrys -- produced by the Wolverine porcelain enamel company, the red and white roof tiles were described as fade proof, rustproof and otherwise indestructible. 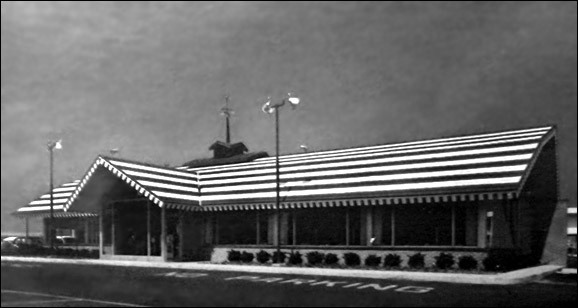 Several other chains as well as independent operators employed the eye-catching porcelain enamel roof tiles including Howard Johnson's, Dobb's House, and Krispy Kreme. Above: The Dutch Pantry shown in Wolverine's propaganda may have been the unit in Selinsgrove. It was likely a one-off prototype with its design influenced by the optimism of the space age. With its sleek lines and stylized cupola it doesn't really invoke the Pennsylvania Dutch countryside, rather it looks "Barn-Moderne!" "Queen of Mean" in 1980, and then she sold the chain along with other property in 1999. Hospitality it's more than just our name! 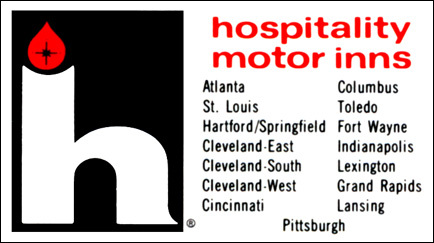 Standard Oil of Ohio (SOHIO) created Hospitality Motor Inns (HMI) as a subsidiary in 1964. SOHIO's idea was to increase its market share by adding divisions that it felt were related to its core gasoline business. 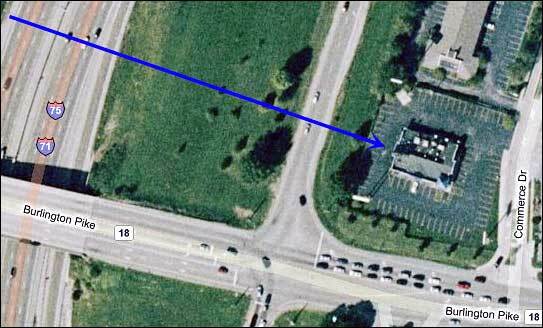 Its first motor inn was an exceptionally modern and well-planned 159 room property located in Willoughby, a suburb of Cleveland. Later the chain was moved upscale with the addition of at least four Ambassadors Row hotels. Dutch Pantry entered the picture in 1967 after SOHIO through HMI became the chain's largest franchisee. its first Dutch Pantry opened in Wadsworth just outside of Akron in 1968. HMI became a public company in 1972 and was sold to Harry and Leona Helmsley in 1980 for $36 million. After the sale the motor inns promptly became Harley Hotels. Meanwhile the Helmsleys retained ownership of HMI's 35 Dutch Pantrys in five states, but did not operate them. Instead it leased the restaurants to an outfit based in New York called Rains International. Below: The unidentified location shown in a generic postcard exemplified the chain's fully realized style and design which reached its zenith during the latter 1960s and early 1970s. Advertisement (Tampa Tribune or St. Petersburg Times?) Aug. 1966 (provided by Robby Delius). “Charleroi Has a Lot to Offer Industry.” The Valley Independent/The Valley Bonus 6 June 1983, 9. “Dog House Chain Has New Owners.” The Independent Pasadena Star-News 17 May 1968. Donahue, Dan. Correspondence concerning Hospitality Motor Inns 1 Dec. 2007. Dutch Pantry/Hospitality Motor Inns directories circa 1980 (provided by Dan Donahue). “Dutch Pantry Eating Units Set for Ohio.” Coshoton Tribune 26 June 1967. “Dutch Pantry Opens Monday.” Clearfield Progress 24 Nov. 1973, 6. “Dutch Pantry Sales up 33%; Renovation.” The Valley Independent 30 April 1984, Sec. C.
"Dutch Pantry Sets Opening Date." Lima News 23 April 1975, 30. "Dutch Pantry to Open in Speers" The Valley Independent [Monnessen] 12 May 1978, 10. "East Side Retail Business Increasing," Lima News 8 Dec. 1974, C10. Gardner, Bob. “Solutions are Sought to Restaurant Closing.” The Valley Independent [Monnessen] 17 April 1987, A5. Groth, John C., Paul D. Phillips, R. Malcolm Richards. "Financing the Alaska project: The Experience at Sohio," Financial Management, Vol 8 No 3 Autumn 1979 pp 7-16. “Ivan E. Wilson to Manage New Mansfield Dutch Pantry Restaurant.” The Wellsboro Gazette 27July 1967, 5. Kelly, Denny. 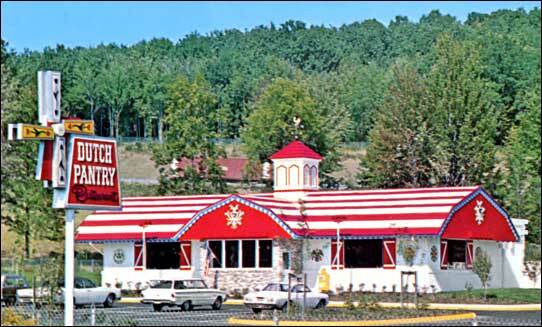 Correspondence concerning the now demolished S. Dirkson Parkway Dutch Pantry restaurant in Springfield, IL and the children's menu poem, "Der Distlefink," that his then 5 year-old daughter memorized for a free sundae--a story which became a part of his family's lore, Jan 12, 2008. Pantages, Larry. “Eviction Action Against Dutch Pantry Operator.” The Akron Beacon Journal 20 Aug. 1985, B5. "Park, Office Restaurants Planned at Higgins-Rte. 53" Chicago Daily Herald 15 July 1977, sec. 2. “Pumpernickel's for a Change; A Unique Meal in a New Decor.” The Wellsboro Gazette, 11 Aug. 1982, 6. “Putnam Co. Opens New Dutch Pantry.” The Wellsboro Gazette, 8 Nov. 1973. "Glasiron Porcelain Enamel Shingles by their Roofs you know them." Wolverine Porcelain Enameling Co. circa 1960s (provided by Tim & Tom Bernert). "Shoney's Restaurant Buys Dutch Pantry." The Orlando Sentinel 21 Aug. 1989. “Sohio Builds Dutch Pantry Restaurants.” Coshoton Tribune 10 Oct. 1967. “Standard Oil Co. Plans Operation of Restaurants.” The Van Wert Times Bulletin 29 Aug. 1968. “Table-Hopping.” Syracuse Herald Journal 17 Sept. 1976. Weirick, Joel. Correspondence concerning Lottie and Jess Kemberling, their founding of the chain, Florida expansion, the 1963 Selinsgrove fire, penning of the "Der Distelfink" poem, sale of the company to Best Foods in the late 1960s, and many happy childhood memories of his family's chain, Jan 30, 2008. Jackle & Sculle authors of The Gas Station in America incorrectly state on page 72 of their opus that Standard Oil of Ohio (SOHIO) flirted with motel construction through their L & K motel subsidiary. While there was a chain of L & K motels which had a substantial presence in Ohio which included "friendly L & K Restaurants," the chain was not related to SOHIO and the authors must have confused L & K with Hospitality Motor Inns. The purpose of this site is informational. It is neither commercial nor representative of any brand, company, or business. Any trade names, trademarks, etc. that are depicted remain the property of their respective owners. Please contact this site's owner prior to reproducing any part of it. Works from contributors (includes photographs, ephemera, etc.) lent to highwayhost.org and any of its affiliated sites may not be reproduced without their consent.